Frederick John Rebescher was born on July 21, 1909, in Buffalo, New York. He was baptized on July 26, 1909. On October 11, 1929, Frederick married Cleo (Chloe) Elizabeth Olskey, daughter of Conrad (1876 - 1941) and Margaret (née ???) Olskey . Cleo was born on July 19, 1909. Frederick worked as a commercial building contractor. According to his son, Richard Paul Rebescher, among Frederick's projects was the construction of the Infant of Prague R.C. Church at 921 Cleveland Avenue in Cheektowaga, NY. Frederick died on June 26, 1995, in Springville (Cattaraugus County), New York. Cleo died on October 4, 1998, in Salamanca, NY. 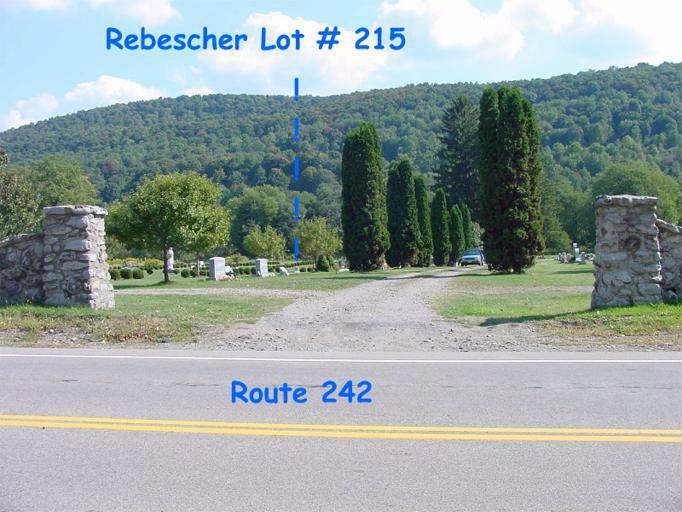 Both are interred in Holy Cross Cemetery, Highway 242, Ellicottville, NY, with the cremains of Cleo emplaced on top of the coffin site of Frederick. Information provided by Donald E. Mack. 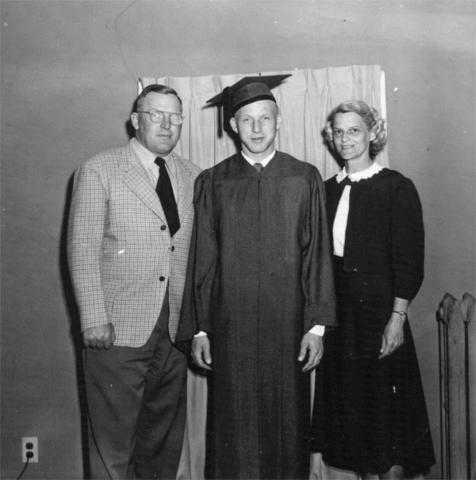 Frederick John Rebescher, Richard Paul Rebescher, and Cleo (née Olskey) Rebescher, on Richard's graduation day. 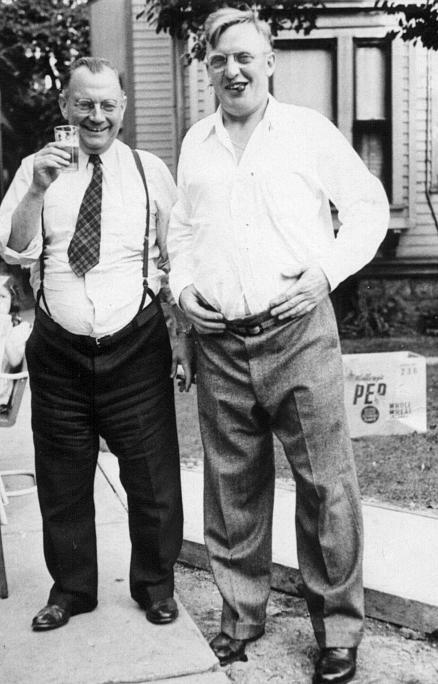 Frederick John Rebescher, comparing bellies with his friend George Abele. 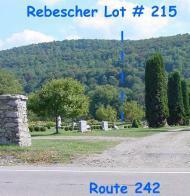 General location of graves of Frederick John Rebescher, Cleo (née Olskey) Rebescher, and grandson Andrew Richard Rebescher (son of Richard Paul and Geraldine [née Masten] Rebescher), Lot 215, Saint Therese Garden Section, Holy Cross Cemetery, NY Route 242, Ellicottville, NY. 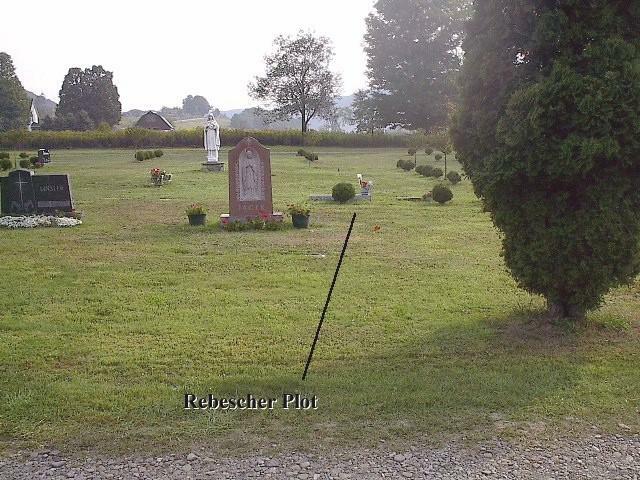 A cemetery plot map is available here. 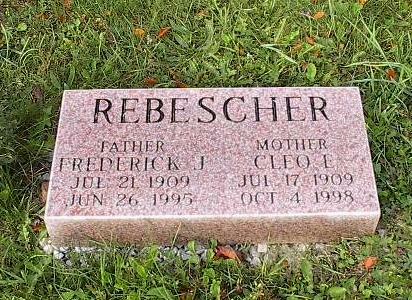 Grave of Frederick John Rebescher and Cleo (née Olskey) Rebescher, Lot 215, Saint Therese Garden Section, Holy Cross Cemetery, NY Route 242, Ellicottville, NY. 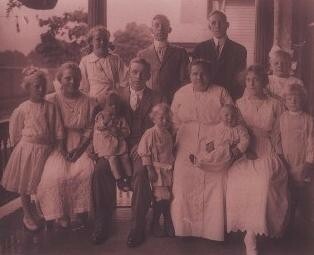 Baptismal Record: Frederick John Rebeschki, born July 21, 1909, baptized July 25, 1909. Godparents: Frank and Christine Schlia. 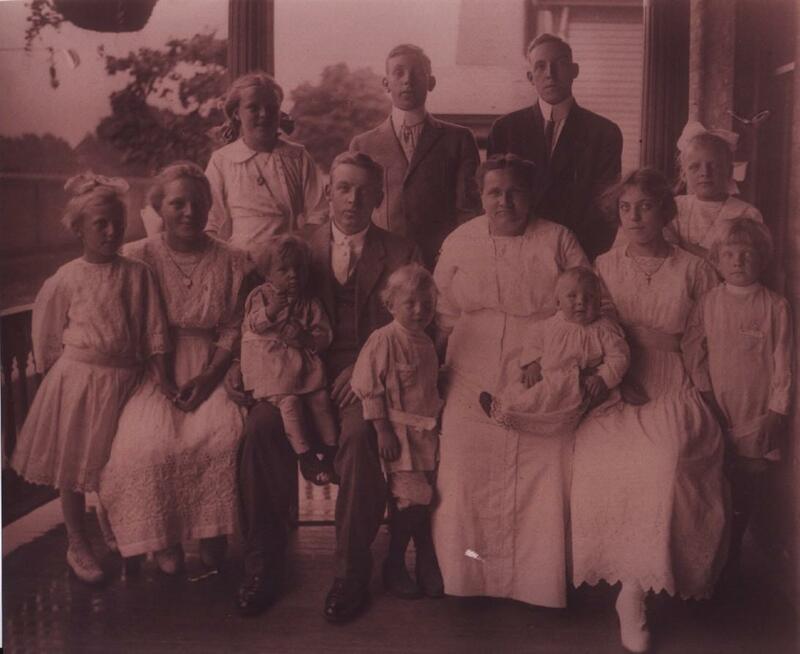 1910 Census Record: Bernhard ("Barney") and Rosalia ("Rose") Rebesher, and family. The record shows them residing at 110 Durrenburger Place. The street was later renamed Timon Steet. 1920 Census Record: Conrad and Margaret (née ???) 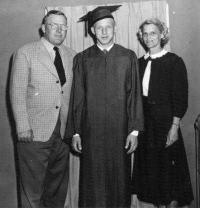 Olskey, and family. Funeral Mass Card: Conrad Olskey, father of Cleo Olskey; born July 31, 1876, died November 25, 1941. 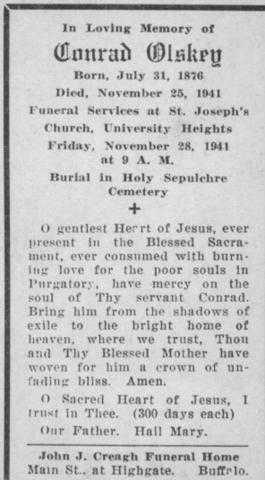 Funeral services at Saint Joseph's Church, University Heights on Friday, November 28, 1941. Interment at Holy Sepulchre Cemetery. 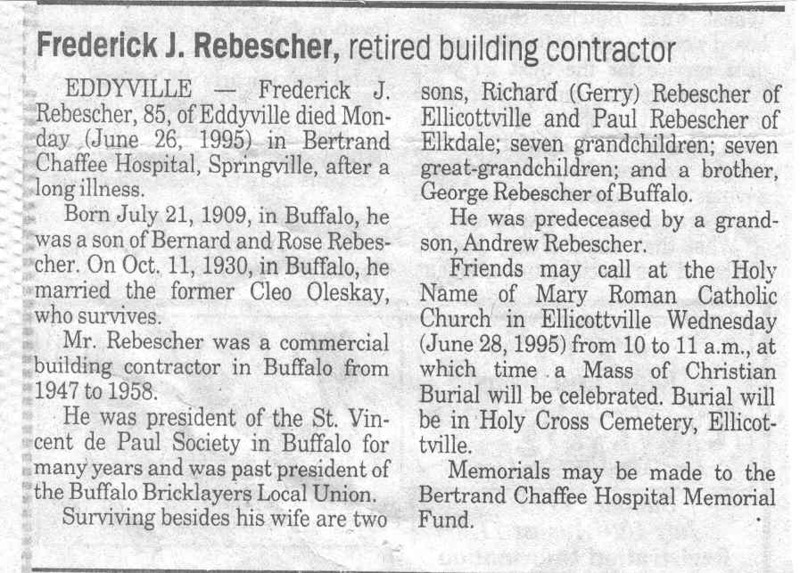 Obituary: Frederick John Rebescher; born July 21, 1909, died June 26, 1995. Note that spelling of Cleo's surname is incorrect. 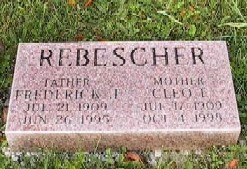 Funeral Mass Card: Frederick John Rebescher; born July 21, 1909, died June 26, 1995. Funeral at Holy Name of Mary R.C. 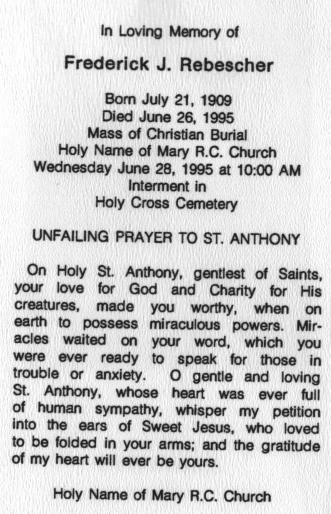 Church on Wednesday, June 28, 1995. 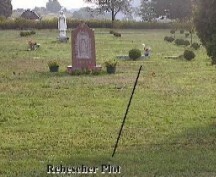 Interment at Holy Cross Cemetery, Ellicottville, NY. 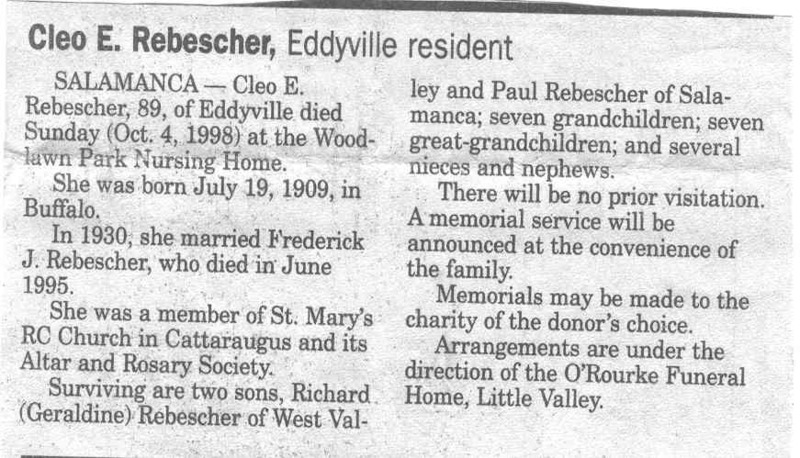 Obituary: Cleo Elizabeth (née Olskey) Rebescher; born July 19, 1909, died October 4, 1998. 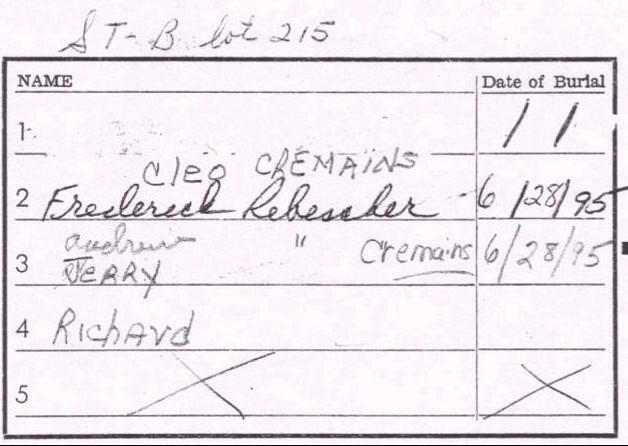 Interment Record: Frederick John Rebescher and Cleo Elizabeth (née Olskey) Rebescher, Saint Therese Garden portion of Holy Cross Cemetery, Ellicottville, New York. 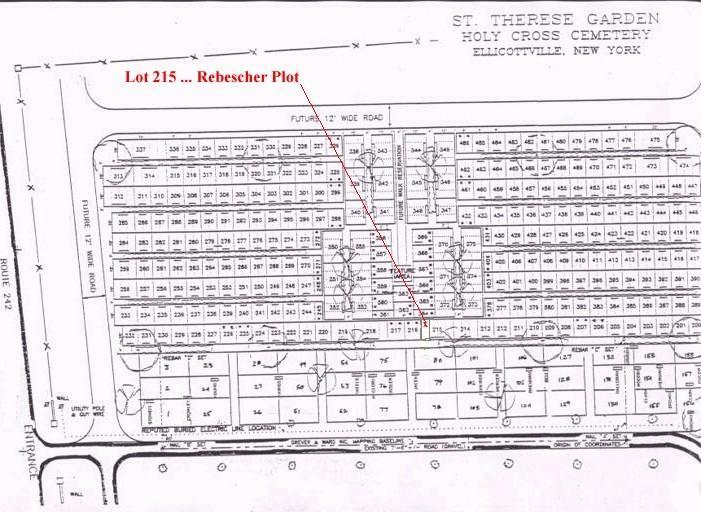 Cemetery Plot Map: Frederick John Rebescher and Cleo (née Olskey) Rebescher, Saint Therese Garden portion of Holy Cross Cemetery, Ellicottville, New York.